Each artist has either a single-page entry or a double-page spread, with a capsule biography and examples of key works. Some notable entries include Milton Glaser (one of America's most celebrated graphic designers), Robert Crumb (the comic-strip artist who created the alternative Zap Comix), Gerald Scarfe (the Sunday Times cartoonist), Fritz Eichenberg (an engraver, and author of the excellent The Art Of The Print), and Shepard Fairey (the street artist whose Hope poster became a symbol of Barack Obama's election campaign). While the glossy, colour photographs are impressive, the text is less substantial. Each chapter begins with an overview of the decade in design, contextualised with details of contemporaneous news events. In the final chapter, for example, we learn that "on 26 January 2001 an earthquake hit Gujarat in India killing around 20,000 people". These news summaries seem like padding, and they're irrelevant in a book about illustration. The bibliography is another weak point: only eighteen books are listed, five of which were written by Zeegen himself. All of the works cited were published in the last two decades, thus classic texts such as A History Of Graphic Design (Philip Meggs) and History Of The Poster (Josef and Shizuko Muller-Brockmann) aren't included. Also, two children's history books are listed (! ), though I have no idea why. In his introduction, Zeegen recognises that the book's fifty-year time-frame is "a mere slice of the discipline's rich heritage". Illustration: A Visual History, by Steven Heller and Seymour Chwast (who has an entry in Fifty Years Of Illustration) covers illustration from the Victorian era onwards, and is therefore more highly recommended as an introduction to illustration. A History Of Book Illustration, by David Bland, is the most comprehensive book on the subject. The book's publisher, Laurence King, has produced definitive histories of various artistic disciplines, including A World History Of Art, A World History Of Architecture, A History Of Interior Design, Graphic Design: A New History, History Of Modern Design, and Photography: A Cultural History. 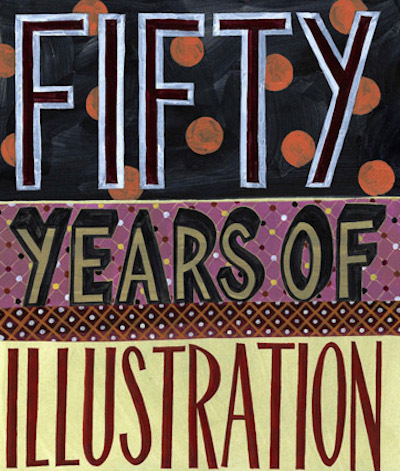 Fifty Years Of Illustration is less ambitious, though it is useful as a sourcebook of modern and contemporary illustration.